So you think you are pretty good at reading people and or social situations. What is the situation in this picture? I'll pick the best comments and post the best answers. "So I drugged this blonde girl - she's pretty space out right now - and I was hoping to sell her to one of your rich Yakuza friends." Three would-be models pose against a dull background for an uninspired photographer. 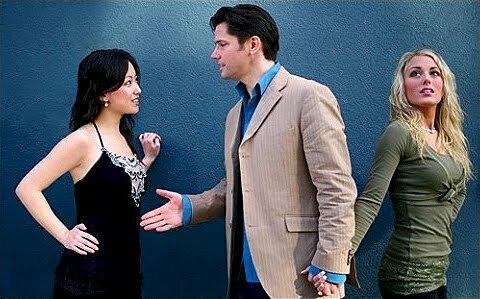 The guy is talking to his ex-girlfriend in black, and his current girlfriend is standing there in green behind him twirling her hair trying to look hotter than his ex while she rudely waits.